Sustainable consumption? Reconfiguring businesses, infrastructure and institutions? What do these words mean? They do not mean merely reshuffling the existing order, but rather replacing it with a completely new economic system, one that has never before been seen or used in the history of the world. This paper will demonstrate that the current crisis of capitalism is being used to implement a radical new economic system that will completely supplant it. It is a revitalized implementation of Technocracy that was thoroughly repudiated by the American public in 1933, in the middle of the Great Depression. The Technocrats have resurfaced, and they do not intend to fail a second time. Whether or not they succeed this time will depend upon the intended servants of Technocracy, the citizens of the world. Founded by Howard Scott and M. King Hubbert in 1932 [ACS Editor’s note-1] during the Great Depression, Technocracy proposed a radical new solution for the world’s economic ills. Porter’s plan included abandoning the gold standard, suspending the stock exchanges and nationalizing railroads and public utilities. If Technocracy had truly been extinguished before the onset of WWII, we would not be concerned about it today. However, when Zbigniew Brzezinski wrote Between Two Ages – America’s Role in the Technetronic Era in 1968, it was essentially a Neo-Technocratic treatise calling for a fourth and final stage of world history, or the Technetronic Era. Without some knowledge of historic Technocracy, exactly what the Trilateral Commission ultimately had in mind with such a goal could not possibly have been understood. Is Carbon Currency – A New Beginning for Technocracy? , the subject of historic Technocracy was introduced in the context of creating a new economic system based on energy accounting rather than price accounting. An energy-based accounting system uses “energy certificates,” or Carbon Currency, instead of dollars or other fiat currencies. Periodic and equal allocations of available energy are made to citizens, but they must be used within the defined time period before they reach an expiration date. Furthermore, the ability to own private property and accumulate wealth would be deemed unnecessary. The pressing and unanswered question is, how would such a Technocratic system actually be implemented? This paper will now address the strategy, tactical requirements and progress of establishing an energy-based Technate in North America. The Technocracy Study Course, written by Howard Scott and M. King Hubbert in 1932, established a detailed framework for Technocracy in terms of energy production, distribution and usage. According to Scott and Hubbert, the distribution of energy resources must be monitored and measured in order for the system to work – and this is the key: monitoring and measuring. Register on a continuous 24 hour-per-day basis the total net conversion of energy. Namely, to exhaustively monitor, measure and control every kilowatt of energy delivered to consumers and businesses on a system-wide basis. Smart Grid is a broad technical term that encompasses the generation, distribution and consumption of electrical power, with an inclusion for gas and water as well. America’s aging power grid is increasingly fragile and inefficient. Smart Grid is an initiative that seeks to completely redesign the power grid using advanced digital technology, including the installation of new, digital meters on every home and business in the U.S. These digital meters provide around-the-clock monitoring of a consumer’s energy consumption using continuous 2-way communication between the utility and the consumer’s property. Furthermore, meters will be able to communicate with electrical devices within the residence to gather consumption data and to control certain devices directly without consumer intervention. “The Department of Energy has been charged with orchestrating the wholesale modernization of our nation’s electrical grid… Heading this effort is the Office of Electricity Delivery and Energy Reliability. This is a relatively new initiative, but it is racing forward at breakneck speed. The Office of Electricity Delivery was created in 2003 under President George W. Bush, and elevated in stature in 2007 by creating the position of Assistant Secretary of Electricity Delivery and Energy Reliability to head it. It is not clearly stated who “charged” the Department of Energy to this task, but since the Secretary of Energy answers directly to the President, it is assumed that it was a directive from the President. There certainly was no Congressional directive or mandate. On October 27, 2009, the Obama administration unveiled its Smart Grid plan by awarding $3.4 billion awarded to 100 Smart Grid projects. This is the “kick-start” of Smart Grid in the U.S.
On January 8, 2010, President Obama unveiled an additional $2.3 billion Federal funding program for the “energy manufacturing sector” as part of the $787 billion American Reinvestment and Recovery Act. Funding had already been awarded to 183 projects in 43 states, pending Obama’s announcement. One such project in the northwest is headed by Battelle Memorial Institute, covering five states and targeting 60,000 customers. The project was actually developed by the Bonneville Power Administration (BPA), a federal agency underneath the Department of Energy. Since it is pointedly illegal for a federal agency to apply for federal funds, BPA passed the project off to Battelle, a non-profit and non-governmental organization (NGO), which was promptly awarded $178 million. “The project will involve more than 60,000 metered customers in Idaho, Montana, Oregon, Washington and Wyoming. Using smart grid technologies, the project will engage system assets exceeding 112 megawatts, the equivalent of power to serve 86,000 households. ‘The proposed demonstration will study smart grid benefits at unprecedented geographic breadth across five states, spanning the electrical system from generation to end-use, and containing many key functions of the future smart grid,’ said Mike Davis, a Battelle vice president. Battelle and BPA intend to work closely together and there is an obvious blurring as to who is really in control of the project’s management during the test period. As the World Wide Web (WWW) is to people, the Network of Things (NOT) is to appliances. This brand new technology creates a wireless network between a broad range of inanimate objects from shoes to refrigerators. This concept is “shovel ready” for Smart Grid implementation because appliances, meters and substations are all inanimate items that technocrats would have communicating with each other. “The GFA Controller developed by Pacific Northwest National Laboratory is a small circuit board built into household appliances that reduces stress on the power grid by continually monitoring fluctuations in available power. 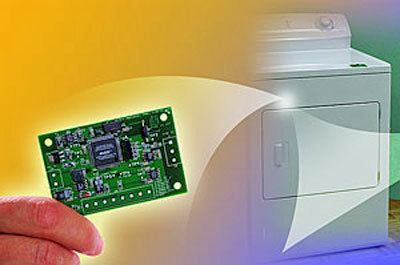 “The controller is essentially a simple computer chip that can be installed in regular household appliances like dishwashers, clothes washers, dryers, refrigerators, air conditioners, and water heaters. The chip senses when there is a disruption in the grid and turns the appliances off for a few seconds or minutes to allow the grid to stabilize. You can see how automatic actions are intended to be triggered by direct interaction between objects, without human intervention. The rules will be written by programmers under the direction of technocrats who understand the system, and then downloaded to the controllers as necessary. Thus, changes to the rules can be made on the fly, at any time and without the homeowner’s knowledge. All of this technology will be enabled with Wi-Fi circuitry that is identical to the Wi-Fi-enabled network modems and routers commonly used in homes and businesses throughout the world. Wi-Fi is a trademark of the Wi-Fi Alliance that refers to wireless network systems used in devices from personal computers to mobile phones, connecting them together and/or to the Internet. Ensure the cyber security of the grid. 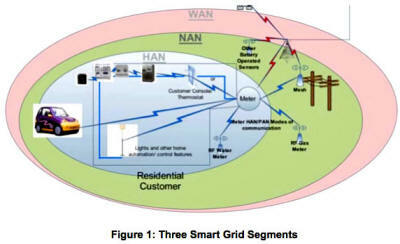 Thus, the bi-directional and real time Smart Grid communications network will depend on Wi-Fi from end to end. While the consumer is pacified with the promise of lower utility costs, it is the utility company who will enforce the policies set at the regional, national and global regulators. Thus, if a neighboring system has a shortage of electricity, your thermostat might automatically be turned down to compensate; if you have exceeded your monthly daytime quota of electricity, energy-consuming tasks like washing and drying clothes, could be limited to overnight hours. Smart Grid and the utility’s control extends beyond electricity. 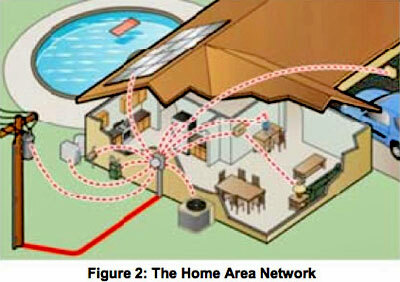 Notice in Figure 1 above that there is a Wi-Fi linkage to gas and water meters as well! Wall Street Journal reported “What Utilities Have Learned From Smart-Meter Tests…” on February 22, 2010, and revealed several important early aspects of smart grid implementation. Nevertheless, the big carrot for utility companies to go along with the government’s Smart Grid is to balance electrical demand, cut back on new power generation facilities and enhance their profit picture. Before the dust settles on Smart Grid, both consumers and utilities may learn some sharp lessons about government intervention: When the government shows up on your doorstep and offers to help you save money, everyone knows that is an oxymoron. Government does not function to help people or companies to save money or to be more efficient; rather, it functions to maintain and increase its own power and control over its citizens. Global companies are rushing to gain their share of the global Smart Grid market: IBM, Siemens, GE, Cisco, Panasonic, Kyocera, Toshiba, Mitsubishi, etc. …and a host of others. Regional organizations such as SMARTGRIDS Africa have been set up to promote Smart Grid in smaller countries. Thus, the global rush is on. In every case, Smart Grid is being accelerated by government stimulus spending. The global vendors are merely lining up their money buckets to be filled up with taxpayer funds. As is the case in the U.S., there was little, if any, preexisting or latent demand for Smart Grid technology. Demand has been artificially created by the respective governments of each country. Smart Grid meets 100 percent of the Technocracy’s original requirements as described above. In other words, it will monitor and control both delivery and consumption of energy and other green resources such as water and gas. The Smart Grid initiative was developed and funded by government agencies and NGO’s. It was the Energy Department’s Bonneville Power Authority that invented the concept in the 1990’s. It was the Department of Energy’s Pacific Northwest National Laboratory that invented the Grid Friendly Appliance Controller. It was the Federal Administration that showered billions of dollars over the private sector to jump-start the nationwide initiative to implement Smart Grid in every community. If the Federal government had not been the initial and persistent driver, would Smart Grid exist at all? It is highly doubtful. Following the same pattern as the U.S., many other industrialized nations are implementing Smart Grid at the same time, using their own stimulus money. This synchronized implementation is certainly by design, and as such, it implies that there must be a designer. Who might be providing such top-down coordination on a global basis must be saved for another paper. The technology being purchased world-wide all originated in the United States and is being marketed by the same global corporations as mentioned above. Lastly, there is an assumption throughout Smart Grid literature that the Federal Administration will have full visibility of all data within the Smart Grid, even down to the individual household. They will also be in a position to set national, regional and local distribution and consumption policies, such as your “fair share” of available energy, gas and water. International standards created for Smart Grid will also enable the U.S. Smart Grid to be connected seamlessly with Canada and Mexico, thus providing a comprehensive North American energy management and distribution system. 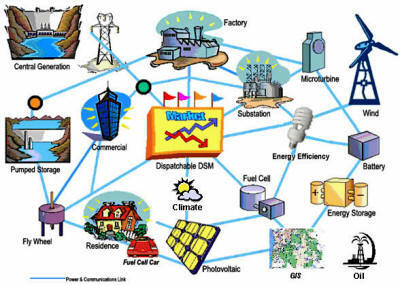 Is Smart Grid destined to be a global phenomenon? Yes. Is it designed to support a new global Technocratic, resource-based economic system? Yes. An attempt to impose a totalitarian, scientific dictatorship. In 1933, it called for the inauguration of Franklin Delano Roosevelt as dictator in order to “pave the way for economic revolution.” Fortunately at the time, they failed in their attempted coup. If today’s Smart Grid is successfully completed, it will enable the conversion of our existing economic system into something far different and far worse. This is why the American people repudiated Technocracy in 1933, and this is exactly why we (and citizens around the world) should thoroughly repudiate it today. Note: In preparing for this report, the editor would like to give special thanks to Dr. Martin Erdmann, Carl Teichrib and Dr.
Michael Coffman, for their encouragement, testing of ideas and additional supporting research. In 1933 FDR declared a National Emergency associated with his mandate for the American people to surrender their gold. Congress gave him dictatorial power. As long as there is a War or National Emergency the office of the President retains that power. Since 1933 not one single President has failed to declare a War or National Emergency, so the dictatorial power remains with the office to this very day. M King Hubbert was educated at Rockefeller’s University of Chicago. At the time he wrote his piece on “technocracy” he was working on his PhD at that institution. He studied Geology and worked for a petroleum company before attaining his PhD. Hubbert then went on to work for Shell Oil. His Peak Oil theory was touted in the 50’s and Rockefeller’s ‘oil is a fossil fuel’ myth was taught at all Western universities and colleges and promoted at global energy conferences throughout the 70’s by his toadies: Henry Kissinger and CIA James Schlesinger. When computers first came out Rockefeller invested in a Harvard economic study. Relay computers were too slow, but the electronic computer, invented in 1946 by J. Presper Eckert and John W. Mauchly, filled the bill. The next breakthrough was the development of the simplex method of linear programming in 1947 by the mathematician George B. Dantzig. Then in 1948, the transistor, invented by J. Bardeen, W.H. Brattain, and W. Shockley, promised great expansion of the computer field by reducing space and power requirements. With these three inventions under their direction, those in positions of power strongly suspected that it was possible for them to control the whole world with the push of a button. Immediately, the Rockefeller Foundation got in on the ground floor by making a four-year grant to Harvard College, funding the Harvard Economic Research Project for the study of the structure of the American Economy. Since energy is the key to all activity on the face of the earth, it follows that in order to attain a monopoly of energy, raw materials, goods, and services and to establish a world system of slave labor, . . . This entry was posted in Economics, Energy and tagged global control, hubbert, Rockefeller, Silent Weapons for Quiet Wars, smart grid. Bookmark the permalink.